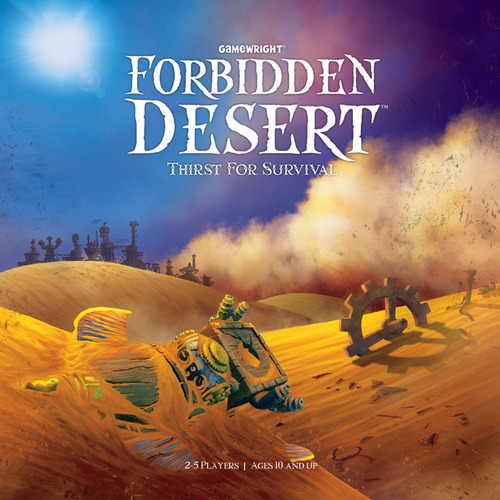 Forbidden Desert* is a cooperative family board game for one to five players. It is the spiritual successor to designer Matt Leacock’s earlier design, Forbidden Island, and is also suitable for youngsters as young as eight (despite the box saying 10). Despite the box being a little bigger than its predecessor’s, you can pick this up for around £20: great value for what you get inside, which includes 50 cards, 72 cardboard tiles and a cool plastic flying machine. An average game should take less than an hour. You take the roles of adventurers that have crashed in the desert; who head to some ancient ruins in search of a legendary flying machine to escape in before you run out of water. While the artwork on the tiles adds a little theme. Each player has a character with its own special ability, but the game’s mechanisms are largely abstract (there’s nothing stopping you hamming things up with a bit of role-play, but it definitely isn’t necessary). As with most cooperative games, teaching is made easier by the fact you’re working together: each player takes it in turns to have a go, but you are encouraged to discuss between you what that player should do on their turn. Before the game starts, the board is created randomly as a 5×5 grid of face-down tiles (you use the same 25 tiles each game). The other 48 tiles represent the sand being blown around the ruins you’re searching – eight of which start on the board. If you ever need to add a sand tile but they’re all already on the tiles, the game is over and the players lose. The same happens if any player runs out of water, or if the storm intensifies too far (see below). You need to win as a team. A player turns consists of taking four actions. Mostly you’ll move (your character to an orthogonal tile), remove sand (from your current or orthogonal location) or excavate (flip over your current tile if it is free of sand). Later you’ll recover machine parts, while some characters have a special ability that uses an action. Flipping tiles is hugely important, as it reveals location clues, equipment, water wells, tunnels and the launch pad (where you’ll need to gather once the machine is complete). You’ll need the locations of all four machine parts to first reveal and then recover them, while tunnels and equipment help you do everything from move swiftly around the board, clear large stacks of sand, peak under tiles, or protect you from the heat. Once a player has taken their four actions, it’s time for the game to take over – and almost certainly be mean to you all. A certain number (3-6, depending on difficulty level and ominously increasing as the game goes on) of the 31 storm cards are flipped over, often shifting the tiles on the board while adding sand to those that move. But three cards reduce the water level of anyone outside (not in a tunnel), while four increase the intensity of the storm (upping the storm cards drawn, and eventually ending the game). Character abilities give each player a unique way to affect the game. The Climber, for example, can move without restriction (usually, if a tile has two sand or more, it is impassable) and take another player with them; the Navigator can move other players as well as themselves; while the Water Carrier can collect and distribute water (usually a well is only useful immediately as it is revealed). The writer: While each game of Forbidden Desert feels different, they always have a delicious mix of feeling rushed while trying to stay safe from losing water. There are different levels set for each player number and difficulty level, showing the care that has been taken to ensure an exciting finish each time if you play well – a feeling of care that is strong throughout the game’s elements. The thinker: This is undoubtedly a very clever design, but there is just a little too much luck here for me to really enjoy myself. It may just be me, but I feel there are times when, no matter what you do, you will end up losing. I realise this has to be the case in a cooperative game, but it doesn’t mean I have to like it – and i’m sure others will feel the same. And it seems worse in Desert than it did with Island, because t feels as if you know earlier if you’re simply not going to be able to get it together (for example, if all the tunnels are very close together on the harder levels). 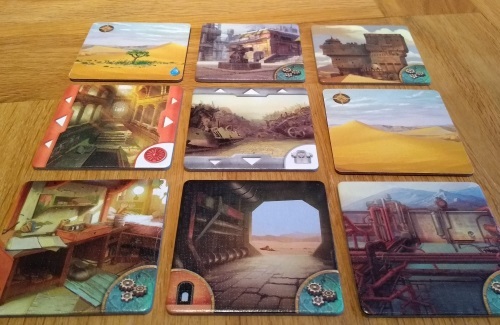 The trasher: The forced cooperation and lack of any room for deception or traitors means Forbidden Desert was never really going to be for me; but it is a great tactical challenge. While the box says 2-5 players I very much enjoy this as a solo experience – me against the game. It feels particularly challenging with two players if you end up with a couple of the less fashionable characters, and for me the game loses nothing by enjoying it alone. The dabbler: I enjoy a great co-op and this is certainly one of those – but that’s not to say it couldn’t be better. While the components are fantastic for the price of the game, I would rather they’d added a bit more, well, character, to the characters: male and female images on both sides, standees or miniatures, and a bit of back story for each would’ve been great. The game itself offers enough variety that decisions are never obvious, so there’s always debate to be had – and the constant blowing of the wind keeps ratcheting up the tension throughout. It’s amazing how often the game seems to go to the wire. As with many games of its type, the ‘alpha player’ problem can rear its head here: when one dominant player takes over, drowning out more quiet participants. As many say to this, simply find better players – but it does needs to be identified. Quite a lot of people find the game boring, which surprises me a little. Lack of theme, combined with a small amount of action choices but quite a bit of between-turn fiddliness (in terms of placing the sand), seem to be the big issues; but I would put this more down to your group’s dynamic than the game itself. If you play this heads down, I can see how it may come across as feeling mechanical and dry. What I do understand is a negative reaction to the how much bad luck can screw you. There are only 31 cards in the storm deck, so it is very possible to get two or even three ‘Sun Beats Down’ cards (that reduce every character’s water level if not in a tunnel) in a single turn. As some players start with just three water, this can be devastating. However, the game lasts well under an hour and is simple to set up, so if you have a terrible start it is very easy just to shrug and go again. Forbidden Desert ranks significantly higher on Board Game Geek than Forbidden Island, and I’d have to agree – if I had to keep just one, it would be this one. While the deck manipulation of Island is the cleverer mechanism, I love how the tension builds here and how the games often feel as if they can go either way right up to the end. But I do think it is group dependent: you need to bring a little personality to the table as without it the game can feel a little mechanical – but as a gateway game for families and newer gamers, I think most people will make it work.